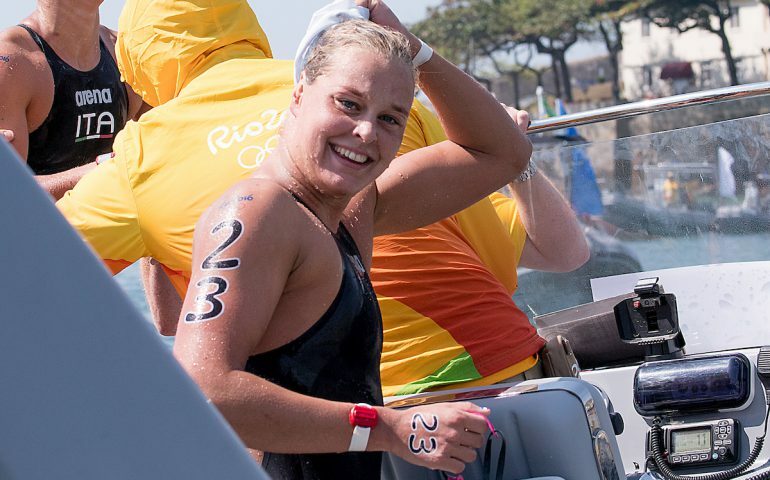 Netherlands’ Sharon van Rouwendaal (cover image) and Italy’s Rachele Bruni grabbed the top two spots in the women’s 10km marathon swimming in Rio. In the women’s water polo three of the four semi-final berths were booked by European teams. After a magnificent race at the famous Copacabana Beach, held in fittingly gorgeous sunshine, Europe had a 1-2 finish, Sharon van Rouwendaal’s finishing sprint brought her a 17.4sec margin win, ahead of Rachelle Bruni. Originally all medals were clinched by our athletes but the incident involving France’s Aurelie Muller and Rachele Bruni at the finishing line led to the disqualification of the French world champion who lost his silver medal, a painful ending after a 10km race. (Thus the third place went to Brazil’s Poliana Okimoto.) Further three Europeans finished in the top ten – altogether five – so our female athletes really made their marks in the ocean. In diving also 50 percent of the qualified athletes came from Europe in the men’s 3m springboard: eight of our divers reached the semis from the qualifications. So far the freshly crowned Olympic champion (in synchro), Britain’s Jack Laugher was ranked the highest (7th) but what will really matter is the final on Tuesday, in the late afternoon. What’s for sure, there is one less potential medal-contenders as for the shock of many, Chinese world champion He Chao couldn’t make the cut – just ahead of him sneaked in Russian title-holder Ilya Zakharov who also came up with an unbalanced performance. Soon Natalia Ishchenko and Svetlana Romashina further strengthened their top position in the neighbouring pool coming first in the synchro duet’s technical routine. Again, the other leading European nations have to challenge the Chinese and the Japanese for making the podium tomorrow. The first really big day in the water polo tournament saw a series of European triumphs in the women’s quarterfinals. Hungary staged an upset by ousting Australia after a penalty shootout. The Magyars trailed 1-5 in the second period but came back to 6-6, and later to 8-8 after being 6-8 down once more. Then they buried all five penalties in the shootout while the Aussies had one miss so the 2012 bronze medallist couldn’t return to the semis. And the London silver medallist also fell, Spain lost to Russia 12-10 in a thrilling game with lots of twists and turns. Italy easily overcame China, beating them 12-7 – the Settebello returns to the top flight at the Games after 2004 while Russia will play in the semis for the first time since 2000. The forth berth went to the world champion US side which enjoyed an easy cruise against Brazil.